The “minimalist” is the pizza we were served in Rome is what we are submitting for this week’s photo challenge. It looked bare compare to the pizzas we are use to which are laden with toppings. Have you been served something that was not what you expected? Please feel free to leave us your comments. This entry was posted in Europe, Italy and tagged Daily Post, food, Italy, minimalist, Photography, pizza, Rome, topping, Travel, Weekly Photo Challenge. My own experience in an Italian restaurant (albeit in Belgium) is a lasagne that was burnt on top. Indeed the top was so overdone I could lift it off like a bit of toast! As to your picture, I smilled at the 4 olives just dropped onto the pizza with no attempt to distribute them! That’s funny…and it really is minimal. Did you need to order seconds? Heheheh – from memory we couldn’t because the pizza blew our “budget” so we cut up the pieces and sprinkled them around ourselves. I bet it was tasty anyway…sometimes we tend to overdo, here at least. yum……love Italian pizza…….simple, but super flavorful! We live in a society where simple seems to be unheard of nowadays when it comes to food. We love pizzas too 🙂 Do you make pizzas at home? We love making the dough and tossing on whatever toppings we wish, not sure how authentic they are though but still tasty! Yes…..I admit this is one of the things I love about living in Italy. Their food truly is – – well – – – simple. They feel that overloading any dish with too many ingredients is a big no-no. I DO make pizza at home… and I love playing around with the ingredients too. I think anything fresh and in season would be considered “authentic” from an Italian’s perspective 🙂 Happy Sunday! Aha!! That explains why Italian food is generally so simple and still so tasty 🙂 Wishing you a lovely week ahead! Hope you and Alex are both well and planning your next getaway! Thank you for your comment. Definitely different to what we get back home. But that was back in 2006 so things may have changed as we know the world dietary habits are all changing to more about quantity than quality sometimes, right? Aha – your blog is another blog we need to duck on over and play catch ups with 🙂 We have just been so swamped with everything that we are losing track of all the awesome blogs we like & still need to visit! 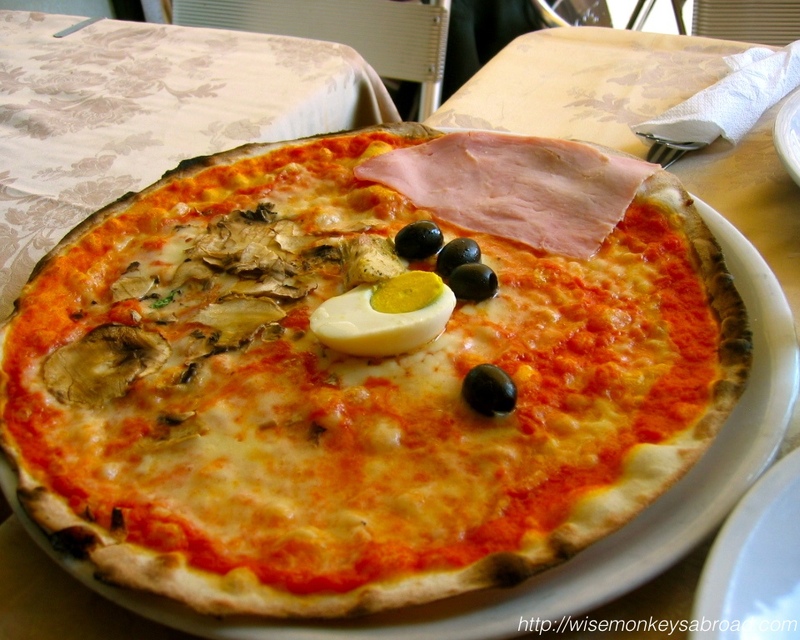 well this pizza looks like some kind of serious “tradition” with the egg and olives – just looks like heritage. Another lovely comment! We simply love reading what you have to say 🙂 both in our comments as well as on your blog! We are back home in Sydney now, trying to gather our thoughts for all the posts we didn’t get to share during our travels!! Just judging by its appearance this pizza would be definitely not on my list of favortie dishes though I usually love pizzas! Did it taste better than it’s looks? TO have half an egg and a slice of ham placed on like that, it was just unusual to see! Hope you guys are enjoying a crazy-free weekend. Yes, we are planning to go to Victoria for a week road trip next year – driving from Sydney so there goes 2 days either side 🙂 We have a wedding in April so thought we would take advantage and spend a little more time. We’ll see. Hoping we can squeeze something else in during January but again, not really sure. Hope you have a beautiful Sunday whatever you are doing. Good luck with planning the road trip. Sounds like a packed trip already. But I suppose that’s how the two of you monkeys roll 🙂 Have a good week ahead. Thanks Mabel Monkey 🙂 Sending you well wishes for a happy Monday! LOL – Actually, it is inspiring us to make our home-made pizzas again 🙂 Did you end up having pizza for lunch? 🙂 Certainly simply and different to what we were use to… this was back in 2006, so maybe things have changed! When I ordered a pizza in Milan this year, it was much the same as yours. Very minimalist. Minus the hilarious “egg” and “olives” – mind you. But it was still delicious. No, mine was extremely satisfying! I really loved the pizza I had in Rome. Just like Janet said, it was from wood burning oven and it tasted way better than any pizza I have had. Sorry for making you hungry 😉 Woodfired pizzas are delicious. It has been a long time since we were in Italy, we are very due to return so we can try the food again and appreciate it from taste buds that are a little “older and wiser” – here’s to hoping we get to go back soon! Ha Ha, definitely too many olives to be ‘minimalist’ 🙂 Only kidding. Brilliant take on the subject. Hahaha – yes, one olive less might have been more fitting – love the way you think 🙂 And as always, your comment made us smile! Enjoy your Sunday, Ken. Yes, it’s not bad to have minimal topping, it’s just different 🙂 Hope you have been well – actually you commenting has reminded us that your blog is another one that we need to duck on over to do some catching up on. We also had that kind of pizza when we travelled in Europe. Not much toppings,,,,, just a thin topping of cheese, and somehing else. This was our first pizza in Rome so we were taken by surprise 🙂 We got use to it afterwards and realised how much topping we don’t really need! Looks good to me. I had one of the best pizzas I’ve ever eaten in Vicenza, Italy some years ago. It was baked in a wood-burning oven. I have been, thanks. Been to France again and to Philadelphia. Now I’m in Iowa for the weekend on a family visit. Then back home to relax for a bit. 🙂 How about you? Seems like if they just spread the ingredients around a bit, then it would be a big improvement. I once had a pizza in Chile that was the complete opposite of this; so many ingredients piled on that they weren’t cooked completely and the stuff at the bottom was still kind of cold!